Why do we need so many ways to pay friends and family? I collected almost a whole page of mobile payment apps after chillin' with different groups who used different apps. As we all struggle to agree on what the best payments platform is, what if we could use them all in harmony? You have Venmo and your buddy loves Bitcoin. His job pays him Bitcoin. Actually, his life savings are in Bitcoin. Unfortunately, for you, you're allergic to Bitcoin and you have to pay him $519.32 (2 BTC) for losing a bet that Bitcoins are still alive in 2015. Fear not! You don't have to use, know, or touch Bitcoin. Simply send us the money with the app you prefer (along with his Bitcoin address), and we'll make sure that your friend gets it in the form he prefers. Substitute out Venmo with Paypal, Square Cash, or your choice of payments and we'll always gladly shuttle the money for you. 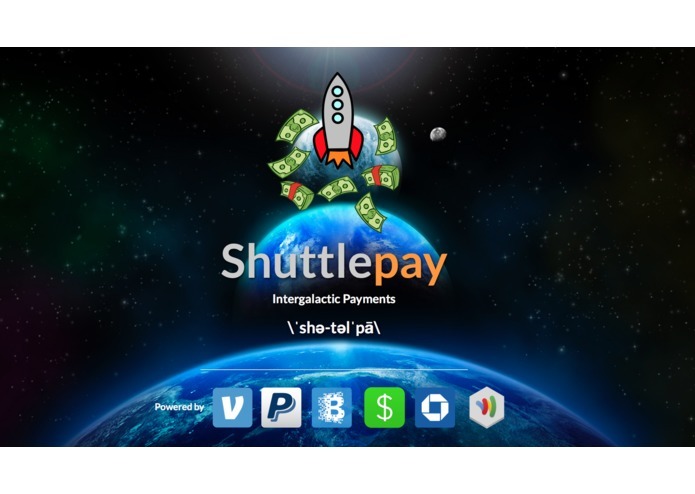 See http://shuttlepay.co/ for the mission briefing and instructions! Dev/sandbox environment bugs and misleading documentation -- really though, everything worked out a lot better than I expected. Huge shoutout to everyone who supported me here (especially Justin Woo from PayPal, and the Blockchain guys). Creating a working product across several platforms. Having the opportunity to go from idea to a (minimum viable) product, doing everything from product to engineering to design and UX. I learned a lot about the various APIs and platforms that this deals with. In addition, I learned that launching a service like Shuttlepay needs a lot more capital than expected...similar to launching spaceships. It would be awesome to work with each platform to obtain proper operating rights and vanity handles/usernames to legitimize Shuttlepay. Note: Currently, only our landing pads on planets PayPal, Venmo, and Blockchain (Bitcoin) are operational. We look forward to serving you on nearby planets Square Cash, Chase QuickPay, and Google Wallets within the next light year.